The Jr. 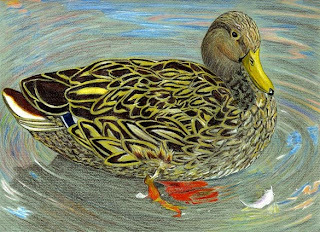 Duck Stamp Program started in 1989 as an educational program with the goal of teaching "Conservation through the Arts." Artwork created for the program must be 9x12 inches and in a horizontal format. There can be no writing on the front of the artwork and the artwork should realistically represent a bird species from the list of eligible ducks, geese, and swans. Each state has a contest with four age groups, the Best in Show is sent on to the national competition. Click here for info on how to participate in the Jr. Duck Stamp Program or here to find information specific to your state. Here is my Jr. Duck Stamp Program Motivation Kit List! Real duck stamps- My dad saves his old duck stamps for me. I have one that was on his hunting license from a couple years ago and the students were really excited about it. Jr. Duck Stamp Poster- If you can get ahold of one! Feathers- I recently added some feathers to my bulletin board display, the curled feathers from a mallard's tail. Students very excited, of course. Examples- I brought my high school JDS drawings and a duck drawing from a couple months ago. I showed each drawing and talked about the different duck species I drew which got the students excited.